If I wanted snow I’d live in Montana. So. Snow happened. Like, lots and lots and LOTS of snow. I don’t have anything profound to say about it, except dayum, winter! Couldn’t you have spread out a little bit? 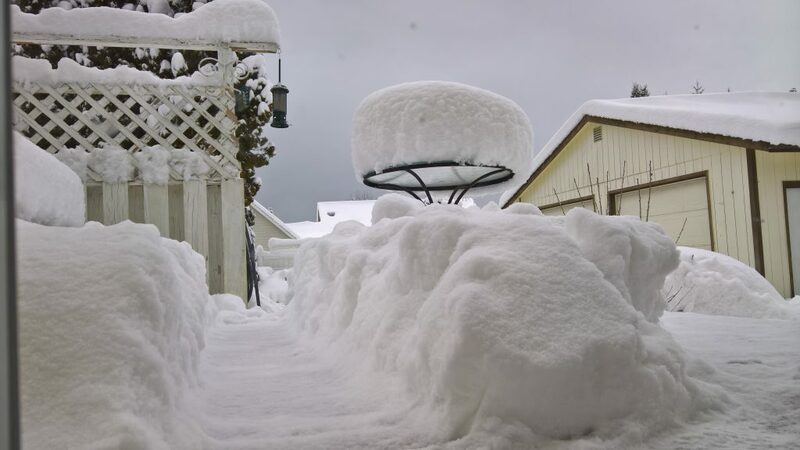 This entry was posted in Contemplations and tagged nature, Washington on February 10, 2019 by Chris Benedict. When the weather clears, we can have beautiful winter days in Washington state. Days like this one, that seem like pearls, or birthday cakes. When that happens, we learn to take advantage while it lasts — a sunny memory to carry us forward when the rains and cold return tomorrow. The beach was full of people enjoying the mild weather, playing and hiking along the narrow Dungeness spit. We didn’t make it out to the end today — maybe a mile at most — before the daylight began to fade. Heading back up the path toward the car, I stopped to take this gorgeous panorama of pinks and blues. Barely visible in front of a glowing Mount Baker, you can see the tiny, historic lighthouse that clings to the tip of the spit. It’s a full five miles out along a rocky ribbon of land that nearly disappears at high tide. Behind it, Mount Baker — an active stratovolcano in the Cascade volcanic arc — rises some 75 miles distant. The Strait of Juan de Fuca, calm and placid today, reflects them like a mirror. 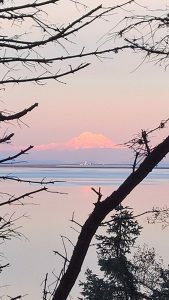 This entry was posted in Contemplations and tagged nature, Washington on November 12, 2018 by Chris Benedict. With the autumn equinox, as the days stand equal to the nights and the light is balanced with darkness, we can no longer pretend that summer isn’t over. The air is crisp some mornings, and though it hasn’t frosted yet, the trees are already sensing that it’s time to prepare for winter. 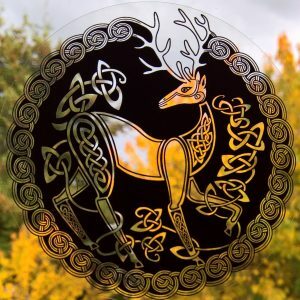 And so like the stag, we should take on the bright colors of celebration. Harvest time has arrived. The apples are getting ripe on the trees, squirrels store nuts, and birds nip at dandelion puffs. The world prepares for the cold, dreary days to come, and so must we. This entry was posted in Contemplations and tagged nature, Washington on September 21, 2018 by Chris Benedict. My babies left the nest today. I’ll miss the little shriekers. It’s been a busy summer for the songbirds in our area, building nests and raising families. A robin has chosen a cleft in the lilac bush outside our kitchen window for her nest, for the second year in a row. I’ve enjoyed watching the activity as sky-blue eggs appeared, and then tiny, cute-ugly dinos hatched out. The first week, they’re naked and uncoordinated — little more than gangly legs and giant beaky mouths on tiny, floppy bodies, with spindly, wobbly necks barely strong enough to lift that enormous head. But on a steady diet of bugs and fruit, the second week they become floofy and grow weird little pins (the start of feathers) on their wings and backs. By now they’re strong enough to snuggle down quiet in the nest and raise a vigorous clamor when a parent brings them a meal, begging for each morsel. Today was the day. One was bravely scouting the lilac branches. His sibling looked down and, with the bold optimism of youth, took a leap and left the nest. 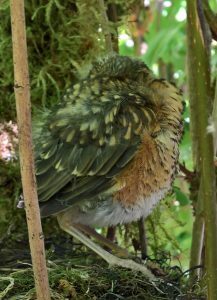 With parents guarding them and shouting angrily at intruders, they will scamper around on the ground until their feathers finish growing, and then they’ll fly. They’ll follow their parents around for a while, learning how to be birds — how to sing, eat, drink, and recognize danger. In fact, any time you see a bird fluttering its wings at another bird, that is a fledgling begging for food. And next year, if they learn well, they’ll raise chicks of their own. Maybe in the same lilac bush. This entry was posted in Contemplations and tagged birds, nature, Washington, wildlife on July 15, 2018 by Chris Benedict. This little sucker figured out how to get to my bird seed. Trouble is, he eats ten times more than a bird. 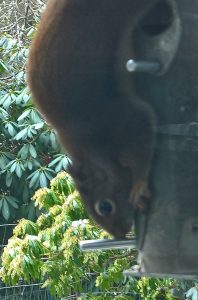 He leaps acrobatically over any obstacle to snarf down the yummy sunflower seeds. So this was my entertainment of the week. I tried moving it farther away but it made no difference. I tried putting a baffle at the top. He neatly skipped around it and continued his thieving ways. I went outside at one point with an old pie tin, intending to make a bigger obstacle to block him. As he was boldly sitting there and refusing to move, I yelled at him. Instead of fleeing, he flew at my face, a bold, ninja-attack of doom! Surprised, I held up the pie tin as a shield and the little sucker bounced off it, yelling at me as he retreated. We’ll see how he likes the new bird feeder I ordered. This entry was posted in Contemplations and tagged nature, Washington, wildlife on February 23, 2018 by Chris Benedict. I’ve been visiting my family in the beautiful state of New Mexico, and marveling at the different wildlife that flocks around. Hummingbirds chase each other from the feeders, a kestrel dives and soars. Buzzards circle in the hot azure skies. Lizards turn suspicious eyes up at me wherever I walk, darting for cover. Butterflies flutter by the dozens, and dragonflies zip past on a mission. Tarantulas and scorpions and vinegarones wander the night. It’s an active and vital place. 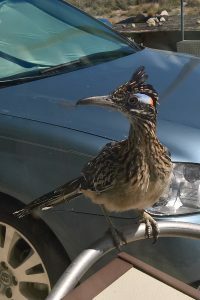 But perhaps my favorite, a plucky roadrunner. Tap, tap… I open the blinds to discover who is making the noise. There he is, perched upon the bird feeder and challenging his own reflection in the wide picture-window. What a beauty he is, with his sharp-curved beak and a vibrant sweep of red, white, and blue behind his eyes. He plucks up a dying beetle and, as he speeds away, I see the iridescent green sheen of his long feathers. “Come again,” I call as he recedes into the distance. This entry was posted in Contemplations and tagged birds, nature, New Mexico, wildlife on October 1, 2017 by Chris Benedict.